Ask fellow campers about "Camp Cadillac" and nearby attractions. I loved this park. It is in a beautiful setting. The sites are mostly level and well spaced apart. I had a great site right across from pool and restrooms. The owners were very friendly and helpful. They work hard to keep the park clean and beautiful. The roads are kept up well so riding my bike as a breeze. Pool was a good size and well maintained. I appreciated the fact that their WiFi was so good since I work from home. This will be my camp of choice if I am ever in the area again. 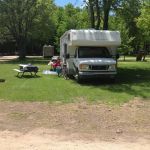 We camped at Camp Cadillac in a Motorhome. I did not go into Cadillac or the surrounding areas but from previous experience I know that Cadillac is a beautiful city with much going on in the summer. Good park for short or long stay. Some sites are shaded and some are a little more open. Interesting layout of some sites, makes it more private and spacious. Well maintained and organized. Close to everything, yet very quiet. Good WIFI. We camped at Camp Cadillac in a Fifth Wheel. We camped here for a week with friends. The campground was kept up well. The showers and bathroom were very clean. The Wi-Fi was very good. The wood they sold was reasonably priced and dry. The roads could be in better condition. The managers were friendly and helpful. We plan on staying there again next year. The only bad thing is there are only a few full service lots. The rest just have water and electric. We camped at Camp Cadillac in a Travel Trailer. The campground was clean. Lake Cadillac was fun to play in. We had a great time. We camped at Camp Cadillac in a Travel Trailer. This park is right off hwy 131 and sites are grass and dirt but level. The park is shady with ample space to walk the dogs. The dumpsters were packed to the brim but we stayed on a Sunday nite and maybe it was because they'd had a busy weekend. Only about 1/4 of the park appeared to be occupied. We camped at Camp Cadillac in a Fifth Wheel. Friendly staff and polite with phone reservation. It appeared to be a big family camp with many activities for kids. Very narrow dirt roads with large pot holes which flooded when it rained and caused a lots of mud. Grass lot was pretty level but poor drainage and also had standing water when it rained. Camped here for two days to attend a wedding. Low rating cause of the condition of the roads. 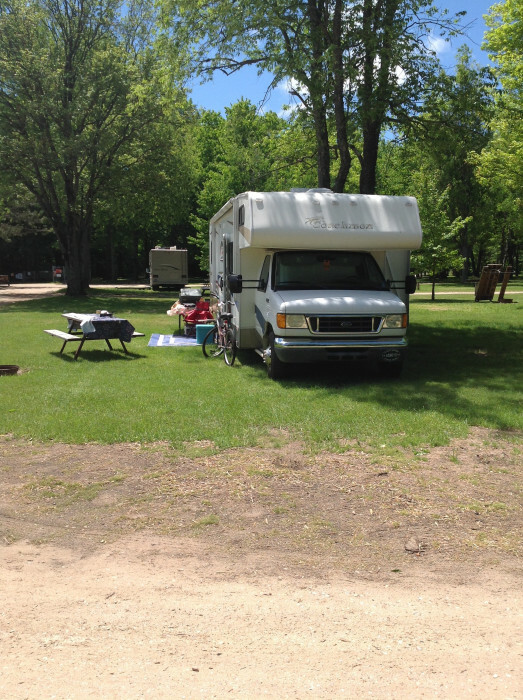 We camped at Camp Cadillac in a Motorhome. Are you affiliated with Camp Cadillac ?